On Tuesday, September 16, 2008, the $62.6 billion Reserve Primary Fund "broke the buck." That meant the fund managers couldn't maintain its share price at the $1 value. Money market funds used that value as a benchmark. Investors were panicking after Monday's bankruptcy of Lehman Brothers. They were taking out their money too fast. They worried that the Fund would go bankrupt due to its investments in Lehman Brothers. That bank had invested a large part of their holdings in mortgage-backed securities and other derivatives. Those investments were losing value because housing prices had started falling in 2006. That meant mortgage-holders couldn't sell their homes for what they paid for them. Banks were foreclosing. As a result, Lehman declared bankruptcy. That panic created an unprecedented run on a supposedly safe money market. On Wednesday, the United States came close to an economic collapse. On September 17, 2008, investors withdrew a record $144.5 billion from the money market accounts. They had always been the safest of investments. That's where companies, sovereign wealth funds, and even retirees keep their cash. During a typical week, only about $7 billion is withdrawn. Worried investors were moving the funds to U.S. Treasurys. That forced Treasury yields to drop below zero. In other words, investors were so panicked that they no longer cared if they got any return on their investment. They just didn't want to lose capital. Money market funds are also where businesses keep their cash overnight. They use it for day-to-day operations. If those funds run dry, your grocery store shelves go empty within weeks. The grocery firms would run out of cash to pay truckers or other distributors. "Huddled in his office Wednesday with top advisers, Treasury Secretary Henry Paulson watched his financial-data terminal with alarm. One market after another began to go haywire. Investors were fleeing money-market mutual funds, long considered ultra-safe. The market froze for the short-term loans that banks rely on to finance their day-to-day business. Without such mechanisms, the economy would grind to a halt. Companies would be unable to fund their daily operations. Soon, consumers would panic." Banks had also been hoarding cash. They were too anxious to lend to each other for fear of taking on bad debt as collateral. Normally, financial institutions have about $2 billion on hand at any given time. By Thursday, they had acquired an unprecedented $190 billion. They wanted to have the cash on hand in case of mass redemptions. America was on the brink of a total run on the banks. Unlike the Great Depression, it wasn't by worried depositors. This time, it was by corporate investors. "Without these funds' participation, the $1.7 trillion commercial-paper market, which finances automakers' lending arms or banks credit-card units, faced higher costs. Without commercial paper, 'factories would have to shut down, people would lose their jobs, and there would be an effect on the real economy,' says Paul Schott Stevens, president of the Investment Company Institute mutual-fund trade group." 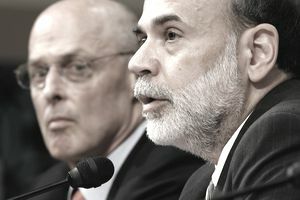 Secretary Paulson conferred with Federal Reserve Chairman Ben Bernanke. He agreed that the problem was beyond the scope of monetary policy. The federal government was the only entity large enough to take effective action. The two decided to ask Congress to appropriate $700 billion to bail out banks in danger of bankruptcy. Why such a large sum? It had to be enough to stop the panic and restore confidence. That's how the money market run triggered the bank bailout bill. Congress balked at approving the bail out of investment banks who purchased mortgage-backed securities. Some didn't believe financial institutions were now in danger of defaulting. Others wanted to let the free market take its course. Still others were concerned about spending taxpayer dollars to make up for those banks’ poor judgments. The money market run showed just how close the global economy was to a catastrophic meltdown. Congress asked Paulson what would happen if the bailout weren't approved. He quietly replied, "Heaven help us all."